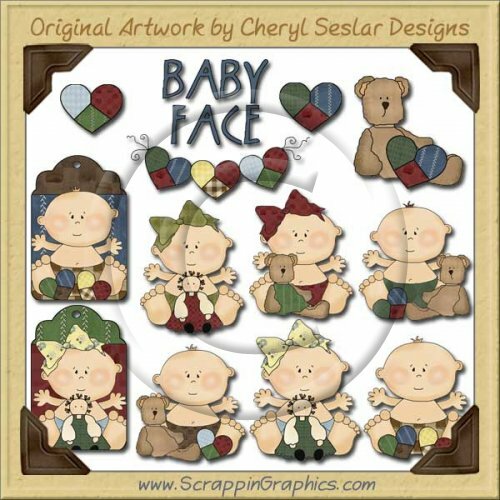 This collection of these adorable and charming graphics is perfect for all your baby projects. This set includes 13 different clip art graphic: quilt heart garland, 2 each baby girls with doll, baby boy, BABY FACE word art, teddy bear, baby boy with teddy bear, baby girl with teddy bear, 2 each quilted hearts, baby boy with heart and teddy bear, baby boy tag, baby girl tag. Great collection for making scrapbook pages, cards, labels, tags, invitations, and other printables.